Pay $1699 for the new Janome Skyline ideal for quilting and patchwork.. Quiet sewing, 196 inbuilt stitches, multipule buttonholes. ideal quilters machine. comes with 6 inbuilt LED lights. ideal for night sewing. save $800 off the recommended retail price.comes with a bonus wide extension table. 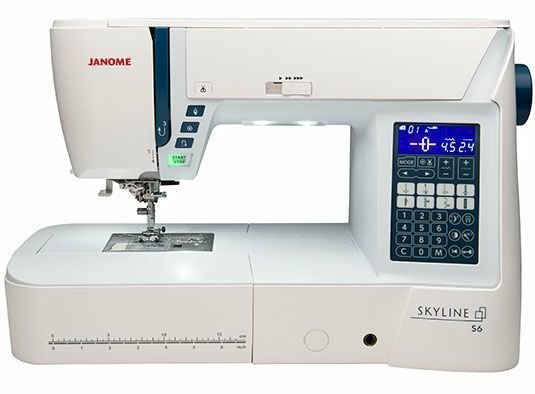 The Janome Skyline S6 sewing machine. The new Janome Skyline is now available. Quiet sewing, 196 inbuilt stitches, multipule buttonholes. ideal quilters machine. comes with 6 inbuilt LED lights. ideal for night sewing. Plus it is being released at $1999. save $500 off the recommended retail price.comes with a bonus wide extension table.